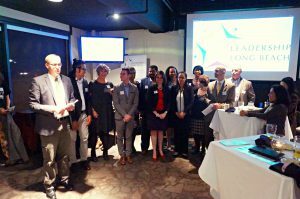 Learn more about the Leadership Long Beach programs. On Monday, May 7 at Skylinks Golf Course, 4800 E. Wardlow, Leadership Long Beach will host a happy hour, meet-and-greet to get information on the principled leadership programs for Leadership Long Beach. Join the Institute Class of 2018 for a tour of the Port of Long Beach on Monday, April 2. The tour provides a ‘behind the scenes’ look at the 2nd busiest port in the nation. You will be able to mix and mingle with current class members, alumni and Port staff on a beautiful day touring the port. This is a free activity sponsored by the Port of Long Beach in support of the LLB Institute program. 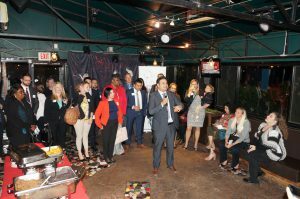 On Monday, March 5 at Alegria Cocina Latina, 115 Pine Avenue, held a happy hour, meet-and-greet to get information on the principled leadership programs for Leadership Long Beach. Thanks to the 50+ volunteers who came out early Sunday, October 8 and helped pass out water and cheered loudly for the runners, walkers and bikers who participated in the 2017 Long Beach Marathon. 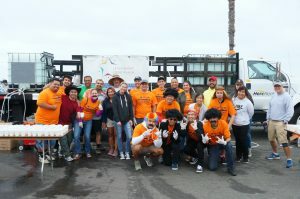 Under the direction of LLB Board member Isaac Romero (LLBI ’12), LLB alumni and friends came out before dawn to arrange the water station setup and stayed until the last few participants passed the 7.5 mile mark of the race. 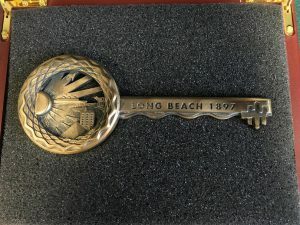 Leadership Long Beach kicked off its 29th year with the Community Welcome Reception on Monday, August 28. 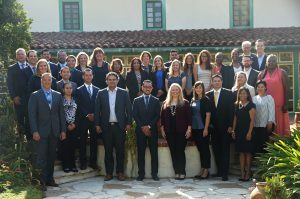 The event was attended by nearly 150 people, which included a welcome by Mayor Robert Garcia, LLBI ’03, as the 32 member class began their first day of the 10-month principled leadership program. 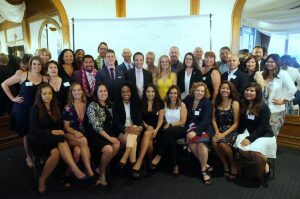 The Graduation Ceremony for the Leadership Long Beach Institute Class of 2017 was held on Monday, June 19th at the Reef Restaurant, 880 S. Harbor Scenic Drive in front of a crowd of nearly 100 people. After completing their 10-month principled leadership program, the 31 community leaders had selected classmates share the experiences of the program and the growth gained. 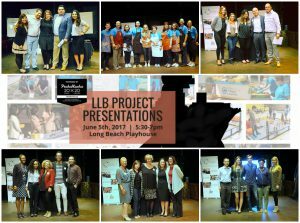 The Institute Class of 2017 and the Youth Leadership Long Beach Class of 2017 presented their projects during a PechaKucha Night. Using the PechaKucha 20×20 format—a simple presentation format where a presenter shows 20 images, each for 20 seconds—the five adult project teams, Farm Stand, Financial Planning Day, College Promise Day, Good Grief event and Median Beautification, gave their story on the purpose, process and completion of their service project and the benefits to the community. 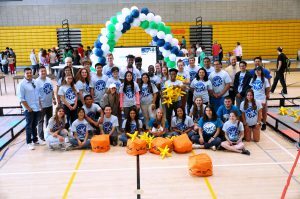 For the YLLB project, RoboBowl V, four youth representing the entire high school group spoke to their planning, preparation and execution that created a day long robotics competition for nearly 200 Long Beach middle school students. 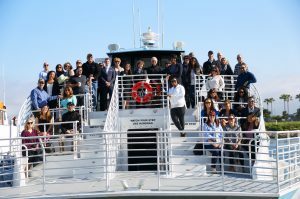 The Institute Class of 2017 was joined by LLB alumni, friends and prospective candidates for the next year’s program during the tour of the Port of Long Beach on Monday, April 3. This tour is part of the Institute program and provides a ‘behind the scenes’ look at the 2nd busiest port in the nation. Leadership Connections is a meet-and-greet mixer to introduce our principled leadership programs to individuals interested in getting involved with LLB. Beginning with this reception, we will be accepting applications for the 29th Institute Class of Leadership Long Beach that starts in August 2017. Also, this will be a great opportunity to see and hear from the current class members and alumni on the benefits and opportunities gained from being involved. 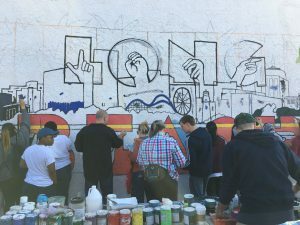 For the city of Long Beach, the MLK National Day of Service was a day residents came together to serve from North Long Beach to the shore. 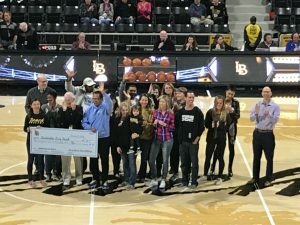 Leadership Long Beach, along with Mayor Robert Garcia (LLBI ’03), Vice Mayor Rex Richardson (LLBI ’10), Councilman Dee Andrews and a variety of community partners, organized seven service projects to allow residents to make it ‘A Day On, Not a Day Off’ holiday in honor of Dr. King. 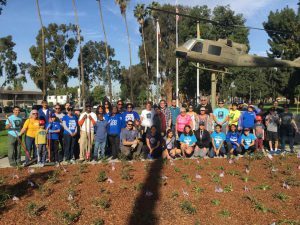 The Leadership Long Beach family marched in the 2017 MLK, Jr. Parade on Saturday, January 14 in Central Long Beach. 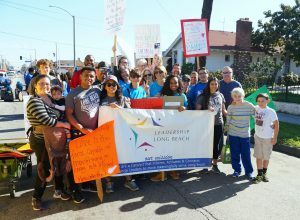 Alumni, friends and family carried signs in support of the Dr. King and the leadership principles of Leadership Long Beach. 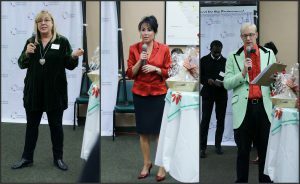 More than 100 people attended the Leadership Long Beach 2016 Holiday Party held on Monday, December 19th, at the offices of Goodwill of South Los Angeles County. Good cheer and the giving spirit was exhibited by everyone in attendance as toys and gifts were donated to Young Horizons, a Long Beach preschool center, and a generous donation made to a Youth LLB alumnus who is continuing to give and serve in the community even though her circumstances are not the best. Thanks to Goodwill of South Los Angeles County Executive Director Janet McCarthy (EQS ’99) for opening the facility to Leadership Long Beach to hold the Holiday Party this year. 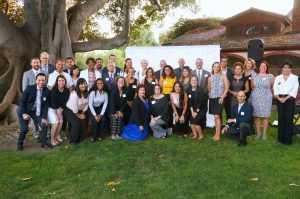 The community came for the introduction to the LLBI Class of 2017 at the Community Welcome Reception held on Monday, August 29 at Rancho Los Alamitos. 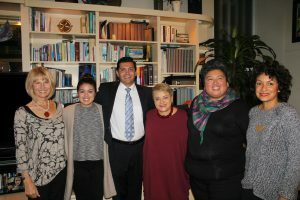 Between the large trees of the Rancho, over 150 people filled the lawn as the group received words of encouragement for their upcoming year from Mayor Robert Garcia (LLBI ’03) and Long Beach City Councilwoman Suzie Price, 3rd District.